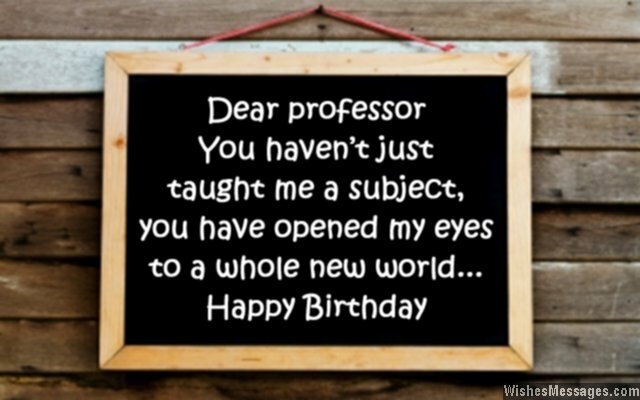 Birthday Wishes for Professors: Thinking of what to write on a birthday card for your professor? Take ideas from this lovely mix of inspirational messages, funny quotes and sweet greetings. Weave your wish around a sense of gratitude for your college prof’s undying commitment to bring out the best in his or her students. Go on, make your professor feel good about being a teacher to students who actually appreciate the lectures, tutorials and classes. Your genuine and heartfelt wishes will go a long way in giving your professor a much needed doze of motivation to trudge on and make a difference in the lives of hundreds of students every year. 1) You haven’t just taught me a subject… you have opened my eyes to a whole new world. Happy birthday. 2) Regardless of whether I become a highflying CEO or a successful academic with a PhD, I will never forget the inspirational guidance of my professor who was so kind to me. Happy birthday. 3) Cheers to a professor who teaches from the heart and mind, and not just from the syllabus and books. Happy birthday. 4) Most professors teach their students how to find the right answers. But more importantly, you taught us how to ask the right questions. Happy birthday. 5) You opened my mind to a thousand new things. Thanks for being a terrific teacher and giving me wings. Happy birthday. 6) Happy birthday to the professor who inspired me to read beyond journals and look beyond classroom walls to reach heights that were beyond my expectations. 7) Learning from terrific professors like you is one of the main reasons that the huge debt of my education loan is going to be totally worth it. Happy birthday. 8) Most professors are experts in subjects that they teach their students. But you are also an expert in two more subjects called Motivation and Inspiration – which you give us every day. Happy birthday. 9) Just like how a professor always remembers a brilliant student, a student also remembers a brilliant professor forever. Happy birthday to one such professor. 10) For students, the journey of education goes from being a dreadful chore to becoming a memorable life experience when it is imparted by professors like you. Happy birthday. 11) To pass tests and exams, bad professors let students cram and rote. Good professors try to explain to students, the stuff written in books. But great professors like you make books come alive by explaining how and why the stuff became worthy enough to be put into a book in the first place. Happy birthday. 12) You are a brilliant professor, extraordinary lecturer, amazing teacher, remarkable mentor and an inspiring counselor. Happy birthday. 13) People like you should be given humanity’s greatest honor because your life’s purpose and motto truly is ‘Changing the world… one student at a time’ Happy birthday prof.
14) Decades later in our lives, we are not going to thank celebrity role models for inspiring us. We are going to thank awesome professors like you. Happy birthday. 15) Taking your classes is never a chore, never a bore. Listening to your lectures is always so inspiring, it the true pleasure of learning. Happy birthday prof.
16) Everyone else only saw the person that I was… but only you could see the person I could become. Happy birthday. 17) I am inspired by everything you teach, everything you say and everything you do. 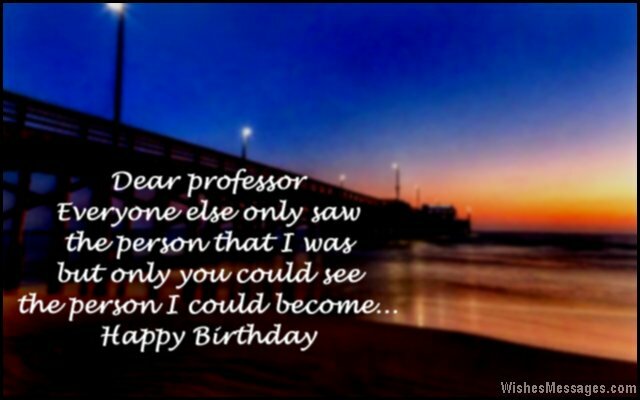 Dear professor, I wish a happy birthday to you. 18) Professors like you add tradition and legacy to the walls of this institution, which you have otherwise been just brick and mortar structures without any character. Happy birthday. 19) Although you are the most demanding and feared professor in the university, you are also the most admired and respected. Happy birthday. 20) It is because of your outstanding guidance that an ordinary student like me has been able to stand out from the crowd. Happy birthday professor. 21) Books are useful to pass tests in college but the priceless advice of professors like you is useful to pass the real test of life. Happy birthday. 22) Congratulations for joining the elite club of the best teachers and most inspiring personalities in my life. Happy birthday professor. 23) There are professors who teach. There are professors who preach. And then there are professors like you… who inspire. Happy birthday. 24) You teach us History but the way you teach, makes it come alive… almost making it seem like the present. Happy birthday professor. 25) I will pay off my student loans but it will be impossible for me to repay my debt to you for giving me the priceless assets of knowledge, skills and life experience. Prof, I will forever remain indebted to you. Happy birthday. 26) You are so cool that sometimes we have to remind ourselves that you are our professor, not our friend. Happy birthday prof.
27) Projects, presentations, discussions, seminars, workshops and tutorials – you are the real heartbeat of every single activity in the college classroom. Happy birthday prof.
28) A university’s biggest assets are not infrastructure and equipment, but brilliant professors like you. Happy birthday. 29) I would have been labeled a quitter and a loser, if you didn’t motivate me to come back to school and become a winner. Thanks and happy birthday. 30) You give back so much to the society by helping students shape their lives and careers. Today is our chance to do something for you in return. Happy birthday. 31) You have not been just a college professor who has helped me graduate and get a degree. You have been a mentor who has helped me become the person that I wanted to be. Happy birthday. 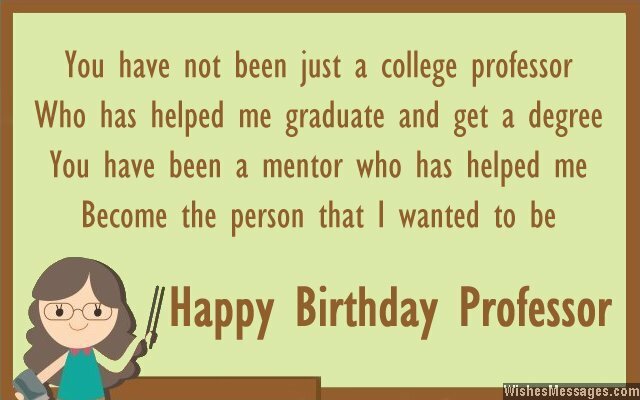 32) A professor who has taught us with so much love and dedication, deserves a grand birthday celebration. Happy birthday. 33) You are one of the only professor I am wishing on Facebook. That should be enough to let you know how cool I think you are. Happy birthday. 34) Giving you birthday wishes is a dangerous thing because it pushes you closer towards retirement and I am sure that the college doesn’t want a brilliant professor like you to go leave, ever. Happy birthday. 35) You are a SuperProf because you have the power to turn boring lectures into animated discussions and make the words out of class texts come alive. Happy birthday to our superhero. 36) You didn’t just teach me disciplines of Liberal Arts. Your wisdom taught me the art of living as well. Happy birthday prof.
37) Four tedious years of college have been worth it only because I got to take classes with an inspirational teachers and professors like you. Happy birthday. 38) One of the highlights of waking up early and coming to uni is to attend captivating lectures of a brilliant professor… none other than you. Happy birthday. 39) You inspire us to make a difference in the other people’s lives, because you made a difference in our lives with your teaching and mentoring. Happy birthday professor. 40) While other professors are busy giving us tips to rote and cram, you do much more by igniting sparks of inspiration and imagination. Happy birthday.